Jermaine McGillvary scored his second successive hat-trick as Huddersfield warmed up for their Super 8s assault with a 40-28 triumph over Wakefield to make it nine wins in 10 Super League fixtures. 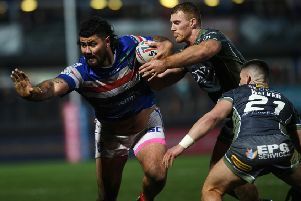 A week after crossing three times in the victory at Castleford, the England winger repeated the act to help his side leapfrog their opponents in the table. The Giants were the dominant force for much of the opening period and thoroughly deserved their 30-10 interval advantage. Within five minutes the hosts took the lead for the first time as the in-form Lee Gaskell sent Jordan Turner clear to feed Jordan Rankin to finish off. Danny Brough made no mistake, adding the first of his five first-half conversions, two of which were from the touchline. Trinity waited just three minutes to find their response, with Ryan Hampshire’s kick to the corner finding Ben Jones-Bishop to finish off. Hampshire then landed the touchline goal. The visitors did not help their cause when Matty Ashurst was sin-binned for dissent two minutes later, and just before he returned to the fray the Giants took a tap penalty close to their opponents’ tryline and Brough fed Alex Mellor to crash over from close range. Then minutes later Leroy Cudjoe teased the Wakefield defence before finding McGillvary to show great strength to squeeze in. A strong Bill Tupou try in the 24th minute suggested Trinity were far from finished. But two Huddersfield tries in the 34th and 37th minutes made their task even tougher. Darnell McIntosh was the first to strike as he collected Gaskell’s long pass and finished superbly from 10 metres out before Brough and Gaskell combined to find Cudjoe, who showed lightning hands to put McGillvary over for his 150th Huddersfield try. And he had to wait just four minutes after the break to score try number 151 and complete his second hat-trick in a week by reaching out to touch down, despite the best attentions of Tupou. The Giants’ seventh try of the night came in the 52nd minute when Ryan Hinchcliffe’s trickery was capitalised on by Ukuma Ta’ai to storm over by the posts, with Brough’s goal bringing up the 40-point mark for his side for the first time this season. Wakefield refused to wave the white flag as Jacob Miller’s kick to the corner paved the way for Pauli Pauli to score with the minimum of fuss. Hampshire’s conversion made it 40-16. That lead was slashed even further three minutes later when strong approach play resulted in Justin Horo crashing over for another converted score. But they had to wait until the 78th minute to get any closer to their hosts with a try in the corner from Tom Johnstone, which Hampshire converted from out wide to complete the scoring. Huddersfield: Rankin, McGillvary, Cudjoe, Turner, McIntosh, Gaskell, Brough, Clough, O’Brien, Lawrence, Mellor, Murphy, Ferguson. Replacements: Hinchcliffe, Ta’ai, English, Roberts. Wakefield: Jowitt, Jones-Bishop, Lyne, Tupou, Johnstone, Miller, Hampshire, Hirst, Randell, Fifita, Batchelor, Ashurst, Horo. Replacements: Wood, Pauli, Huby, Arona. Craig Hall scored twice as Hull FC suffered a rare derby defeat to Hull KR, losing 20-16 at the KCOM Stadium. After seven successive defeats to their city rivals, this was a welcome return to victory for Rovers ahead of the Qualifiers.